The Galaxy S6 edge has a purposeful design. Samsung created something for people who like to stand out; they used 3D glass-crafting techniques to create the dual-edge front display. This makes the visual content on the screen immersive and almost three-dimensional. Galaxy s6 edge has an innovative, round-side display that has earned reputation as one of the best screens among other smartphones. The S6 has edge trappers on its right and left sides, where the curved portion of the screen arcs to meet the back. The power button and nano sim card slot have also moved up on this variant. Galaxy has a beautiful 14.47 cm (5.1) HD dual-edge display. It has the dimensions 5.6 x 2.8 x 0.28 in inches and weighs 4.6 (ounces). The curved display isn't only an aesthetic affectation, either but, the Galaxy Edge gives lifelike icons and images than when compared to S6 phone at decent price. 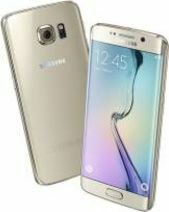 Samsung Galaxy S6 Edge is powered with Quad-core 1.5 GHz Cortex-A53 & Quad-core 2.1 GHz Cortex-A57 that makes Octa core engine which equals to the power of the computer. It has the chipset configuration of Exynos 7420 Octa and the graphics powered by Mali-T760MP8 GPU. S6 edge works on an android operating system of version 5.1 Lollipop and has a confirmed upgrade to the higher version 6.0.1 Marshmallow. It is packed with the powerful 3 GB RAM that provide the faster multi tasking performance ever. It has an internal storage of 32 GB for the apps and personal data storage. It is also available in 64 GB and 128 GB versions. The Galaxy S6 Edge primary camera comprises of 16 MP, f/1.9, 28mm, OIS, autofocus, LED flash. It has some good features like Real-time HDR, VOIS. It has the ability to record HD videos at the rate of 30 fps (frames per second) with a resolution of 3840 x 2160. Talking about the secondary camera, S6 Edge has 5 MP with Auto Focus, F1.9, Real-time HDR features. This 5 MP camera has the capability of taking beautiful selfies and makes skype calling easy. If we talk about the camera in comparison to other smartphone, Galaxy S6 Edge has not that good camera at this price range. Its multimedia features include the sound enhancements like Adapt Sound, Sound Alive, Wise Voice 2.0, Extra Volume 2.0, 2 Mics (Directional Voice Recording). It has a standard music player that supports MP3, M4A, 3GA, AAC, OGG, OGA, WAV, WMA, AMR, AWB, FLAC, MID, MIDI, XMF, MXMF, IMY, RTTTL, RTX, OTA audio formats and a video player that supports MP4, M4V, 3GP, 3G2, WMV, ASF, AVI, FLV, MKV, WEBM video formats. Samsung galaxy s6 edge is powered by 2600mah li-ion battery that is non-removable by the user. It provides a talk time of 18hrs(3G).The devices connectivity includes 4G, 3G, Bluetooth v4.1,supported profiles(LE,ANT+),navigation A-GPS,GLONASS, Beidou with Google maps, wifi with 802.11 a/b/g/nac, with hotspot, USB capability ,the device is capable of fast Charging, wireless charging, download booster, music play up to 50hrs. The Galaxy S6 Edge charges 1.5 times faster than previous Galaxy S models, and it can regain four hours of usage from just 10 minutes of charging. The sensor includes Gyroscope, Proximity Sensor, Barometer, Heart Rate Monitor, Hall Sensor, Geo-magnetic, Accelerometer, RGB Ambient Light Sensor, Finger Scanner. What are the dimensions of Samsung Galaxy S6 Edge? Samsung Galaxy S6 Edge measures 142.1 x 70.1 x 7 mm (Height x Width x Thickness). What is the weight of Samsung Galaxy S6 Edge? Samsung Galaxy S6 Edge weighs around 132 grams. Which Graphics Processing Unit (GPU) is used in the Samsung Galaxy S6 Edge? Samsung Galaxy S6 Edge has Mali-T760MP8. Is Samsung Galaxy S6 Edge a dual SIM phone? Yes, Samsung Galaxy S6 Edge is a dual SIM phone. Can we expand the storage of Samsung Galaxy S6 Edge via micro SD card? No, the storage of Samsung Galaxy S6 Edge cannot be expanded via Micro SD card. What is the internal storage capacity of Samsung Galaxy S6 Edge? Samsung Galaxy S6 Edge offers 32GB, 64GB and 128GB internal storage. What colour options are available for Samsung Galaxy S6 Edge? Samsung Galaxy S6 Edge is available in 4 colors which are White Pearl, Black Sapphire, Gold Platinum and Green Emerald. Is there a 3.5 mm audio jack is available in Samsung Galaxy S6 Edge? Yes, 3.5 mm headphone jack is available in Samsung Galaxy S6 Edge. Which processor is used in Samsung Galaxy S6 Edge? Samsung Galaxy S6 Edge is powered by Octa-core (4x2.1 GHz Cortex-A57 & 4x1.5 GHz Cortex-A53) Processor. How much RAM does Samsung Galaxy S6 Edge? Samsung Galaxy S6 Edge offers 3GB RAM. How is the display quality of Samsung Galaxy S6 Edge? Samsung Galaxy S6 Edge features a 5.1 inches Super AMOLED capacitive touchscreen with 16M colors. Which operating system runs on the Samsung Galaxy S6 Edge? Samsung Galaxy S6 Edge runs on Android 6.0 (Marshmallow) OS. What are the Connectivity options available in Samsung Galaxy S6 Edge? Samsung Galaxy S6 Edge sports Wi-Fi 802.11, Dual-band, Wi-Fi Direct, Hotspot, Bluetooth v4.1, GPS, micro USB v2.0. How many Sensors are available in Samsung Galaxy S6 Edge? Samsung Galaxy S6 Edge has Fingerprint, accelerometer, gyro, proximity, compass, barometer, heart rate, SpO2 sensors. What is the battery capacity of Samsung Galaxy S6 Edge? Samsung Galaxy S6 Edge comes with a 2600 mAh battery. Is the Samsung Galaxy S6 Edge battery removable? No, the battery of Samsung Galaxy S6 Edge is non-removable. Does Samsung Galaxy S6 Edge support Fast Charging of battery? No, Samsung Galaxy S6 Edge does not support fast charging. Does Samsung Galaxy S6 Edge have FM Radio? No, Samsung Galaxy S6 Edge does not have FM Radio. Is Samsung Galaxy S6 Edge waterproof? No, Samsung Galaxy S6 Edge is not waterproof. Does Samsung Galaxy S6 Edge support NFC? Yes, Samsung Galaxy S6 Edge does support NFC. What are the camera specifications of Samsung Galaxy S6 Edge? Samsung Galaxy S6 Edge has a 16 MP rear camera with dual-LED flash and a 5MP front camera. Does Samsung Galaxy S6 Edge has loudspeaker? Yes, Samsung Galaxy S6 Edge has loudspeaker. Can we shoot videos from the phone camera of Samsung Galaxy S6 Edge? Yes, you can record videos from the primary camera of the Samsung Galaxy S6 Edge.